Compass simplifies how leaders get the personal feedback and direction they need, when and how they need it most. Compass is a revolution in simplicity with nothing to install. It is purposefully designed lean and email-based to cut through the complexity and costs typical solutions entail. And being deployed in the primary mode of daily employee communication – email – Compass is the most natural growth tool your teams and leaders will ever use. Compass uniquely synchronizes two critical dimensions of how the best teams work – how the Leader leads and how the team Collaborates. 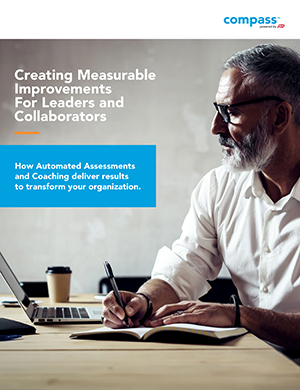 The Compass Leadership Assessment lets team members easily and quickly give leaders anonymous real-time feedback on precisely what behaviors work and don’t work. The Compass Collaboration Assessment focuses on how team members work together and precisely what dynamics work and don’t work. What really drives your people’s daily work behaviors is hard to measure. Compass solves that problem. 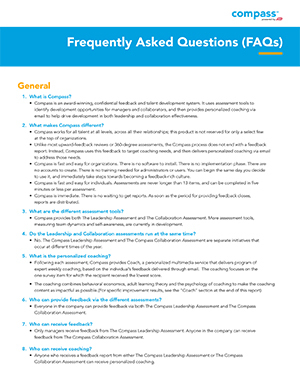 Assessment results are provided in easy to understand reports, with customized guidance for each employee and leader. Real-time, reliable reporting enables each person in your organization to monitor and get more engaged in their own progress, anytime, anywhere. Your company needs your managers performing at their best. The research is clear: when front-line managers fail, top-performing people leave. But when leadership thrives, their people – and the business – thrives too. Exceptional leaders are constantly self-aware, know what makes their people tick, and regularly work on getting better. Compass makes it simple to achieve all of those qualities at every level with an easy, fast and personalized approach that uniquely helps all leaders flourish. 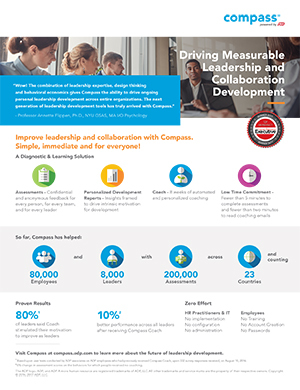 Compass methodically sharpens leadership and collaboration skills by first identifying the skills your people need to improve, and then navigating them through 8 weeks of personalized e-mail coaching. 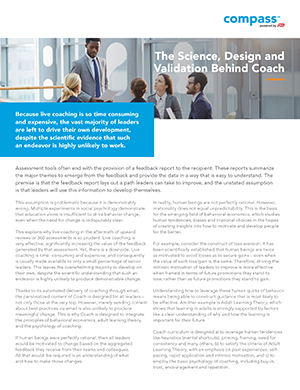 By leveraging the latest Adult Learning Theories and groundbreaking behavioral economics tactics, personal coaching from Compass helps your teams and leaders reliably become the very best they can be, in ways that actually work for them. 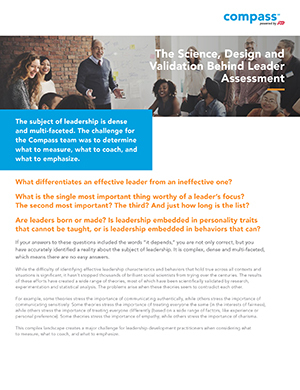 Compass removes the guesswork from wondering what your exceptional leaders could look like. Compare your leaders to your best teams and leaders, and to the world’s best performing businesses, to discover clear new opportunities to enhance your Performance Management, Learning & Development, and Talent Acquisition strategies. Because Compass is built for how your real humans really work, you can now easily see and map how your people really connect, and discover your organizational bottlenecks and "super-connectors". Get a bird’s eye view of how your leaders and influencers interconnect across business units and levels to get their work done. Look no further. Find answers to your most burning questions (and general information) about Compass here.